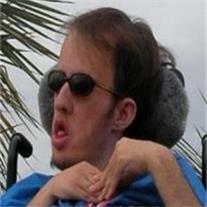 Joshua Ryan Schaffner, 24, passed away September 24, 2010 in Mesa, AZ. He was born May 3, 1986 in Phoenix, AZ. Waiting for him in Heaven are his grandmothers Rita Mae Schaffner and Mable Maracle. Missing him here are his mother and father Robin and Joe Schaffner, aunts Connie, Thelma, Carol, Diane, and Judy, uncles Jim, Bill and Bob. Joshua had many disabilities, he didn’t suffer from them, he ignored them and focused on his abilities. He saw each day as an opportunity to lavish loving attention on those around him. Visitation will be Friday Oct 1, 2010 from 6-8 PM at Bunker’s University Chapel, 3529 E University Dr. in Mesa. Funeral services are Saturday Oct 2, 2010 at 2:00 PM at Mesa First Church of the Nazarene, 955 E. University (between Stapley and Horne) Mesa, AZ 85203 480-964-5062. Donations may be made to the Muscular Dystrophy Association or Phoenix Children’s Hospital.